I've been doing this whole writing thing for a few years now and I have come across, in roughly equal numbers, writers with varying styles and writing guides promoting those various styles. I know writers who are hard-core engineers and plot out their stories using spreadsheets and Github. I know other writers who use note cards taped to the wall to visualize their tale. Others still eschew plotting altogether and simply write words until the story coalesces out of nothingness. All of that got me thinking about Dungeons and Dragons. Follow with me here. When you first sit down to start playing D&D (or any such role playing game), the first step is to create a character. 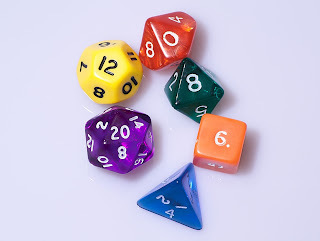 The character is created by rolling dice and assigning those numbers to different statistics that define the abilities of the character. The rolls often determine how the character will need to be played, which attributes will be emphasized and which will need to be minimized. If I were to roll up a character with a lot of strength and charisma but with very little wisdom or intelligence, I wouldn't play that character as a mage or cleric, but that same set of attributes would make a nice cavalier. There isn't really a bad roll when it comes to character, just limits on the way that a character can be played. The same is true for writers. Some of us are ideal engineers, others are poets, others are marketers, and others are professors, but in the end every one of us can write a compelling story. The stats we rolled and the characters we play don't exclude us from writing, but they do force us to consider the best way to take advantage of our strengths and minimize our weaknesses. Authors and D&D characters come pre-set with strengths. For the authors it's a mix of nature and nurture that gave them abilities that turn word-piles into stories. In many ways the abilities of an author are as random and uncontrollable as the roll of the dice for an RPG character. None of us had any choice in where we were born or to whom, we weren't able to decide our genetics or our economics. We all just came into this world with the attributes that were given to us and we have to make the best of it. The engineer, by trade, may excel at creating believable, well-researched worlds, while the philosopher may force the readers to ask the deep questions. Neither is any less a writer though their strengths vary wildly. The flip side of the randomness of our strengths is the utter randomness of our weaknesses. Some of us are born with disabilities or conditions, some of us develop them throughout life. Some authors are crippled by dyslexia others by depression. Some authors struggle with writer's block, unable to come up with ideas, while others are overwhelmed by writer's lock being swarmed by so many ideas they can't seem to choose which one to write. If your RPG character has terrible dexterity, that doesn't make it an unplayable character, but it does demand that you take the stat into account while playing. If you don't, the game or the writing may not be very much fun. If you were to sit down, before rolling up a character, and decide that you could only play a warrior in your D&D game, you might be in for a long slog. If you roll up a character with no strength or constitution, your warrior will be doing precious little damage with each hit and have even fewer hitpoints with which to stay alive. You could, if you were committed, push through, get gear that minimizes your weakness, and never leave the side of your party's healer, but every fight would be a struggle to manage the stats of your character. Sometimes as a writer, I want to do things the way my heroes do. I want to write Game of Thrones or The Lord of the Rings, but I'm not G.R.R.M. or J.R.R.T. (I don't even have that many initials). If I were to insist on writing according to a certain formula or in a certain style, I might be able to do so, but not without constantly managing the struggle of that choice (and likely relying on my cleric-editor to bail me out time after time). If, instead of choosing to force your character down the path of a warrior, you decided to emphasize your character's strengths you might play it as a bard or a thief that doesn't need to be strong or tough. Having that flexibility gives your more options when playing the character which can lead to more fun in the actual game. Struggle is, absolutely, a part of both role-playing and writing, but so too is the fun of rolling high and doing awesome things. By no means am I saying that authors should only concentrate on their strengths and avoid their weaknesses, because we all need to work and grow in our craft, but if it's not fun some of the time, then it'll be increasingly difficult to keep going when the struggle comes. Keeping fun as a part of the work is the carrot that balances out the stick. The point of D&D isn't to craft the best character with the best stats, but rather to go on adventures. The character serves as a vehicle for getting to the adventures not a replacement for the adventures. I'll be the first to admit that it can be fun to obsess over abilities and backstory and gear to tweak a character until it's shiny and perfect. But then that character needs to get beat up and messy as it tackles the challenges in its world. The reward for that effort and struggle is loot and experience that you can use to make your character better so you can go out and have more adventures to get more loot and experience and so on. As a writer it is absolutely important to set the stage for adventure by working on the building blocks. Take classes, learn grammar, dissect story, understand character, go to conventions, participate in workshops, even get a degree. But all of those things, as fun and important as they are, exist to get you ready for adventure, not to replace it. There comes a time when you, the shiny, perfect author, must go out and face the adventures. You may be battered and messy after the attempt, you may fail, you may need near-magical healing to get back on your feet, but without adventure there's no improvement and no way to get to bigger adventures in the future. If you don't get rejected submitting your story, if you don't get bad reviews, if you don't have lackluster sales, you lose out on the experience and the leveling up without which greater adventures would be much more difficult to handle. Also, the loot of the writing adventure can be pretty nice. Writing credits, awards, good reviews, and plain-old money all help to make the next writing adventure that much more fun. Metaphors break down at some point. You probably don't have orcs or goblins to slay in your writing life (unless you do), but the point is this: there is no one template for what makes a writer. If you're a dyslexic introvert with a degree in chemical engineering or a natural poet who's the life of the party and struggles with depression, you have just as much opportunity to thrive as a writer. But trying to fit yourself into someone else's template, trying to judge your weaknesses by someone else's strengths, or trying to perfect yourself before you ever dare put down words on the page will keep you from writing as surely as trying to run a thief with no dexterity or a mage with no intelligence.